But Aidan is a born survivor. And as he works his way deep into Zain's shadowy world, he finds that nothing is as it seems. Zain is a mesmerizing, Gatsby-esque figure who lures young women into his orbit—women who have a bad habit of turning up dead. But is Zain really responsible? And will Isabelle be next? Before long, Aidan finds himself in over his head, cut loose by his superiors, and dangerously attracted to the wrong woman. How can he save the girl if he can't even save himself? The young couple crossed over to avoid me, and I heard the jingle of loose change in someone's pocket. A street you see every day can look unfamiliar, lying facedown on the ground, and it took me a minute to work out where I was. The pavement was frozen. Low-hanging fog blurred the air, and nothing could pass through it without being altered somehow. It threw the whole city out of focus, taking the shine out of another Friday night. My left arm had gone numb and I rolled off it to check the time. The face of my watch was shattered. Assuming it had stopped when I hit the floor, assuming that had only been a few minutes ago, I still had over an hour. I could get into some dry clothes and be at the bar in plenty of time to see the handover. I felt my way up a wall and got to my feet. My face hurt and my brain felt like it had come loose, rattling around inside my skull, erasing pin numbers and names of childhood friends. I watched the young couple disappear into the fog. In spite of social media, CCTV and the state, we still live in a world where you can disappear if you want to. Or even if you don't. It had been about a month since the story leaked. A month since I'd gone missing. I felt the back of my head where someone had just hit it, hard. My wallet was still in my pocket, so I hadn't been mugged. I'd been warned. There was no one else around but I could feel eyes all over me. The street swayed and I held on to a lamppost to steady it. When I started to walk I went for long stretches with my eyes closed, not even thinking about bumping into things. Turning a corner, I found myself on Back Piccadilly, immediately recognizing its exhausted red bricks by their external fire escapes. These buildings wall in a narrow alley on both sides, making a claustrophobic throughway. The evening rain had caught the moonlight, and I started walking out of nostalgia as much as anything. There was an all-night coffee shop at the other end, and I'd spent some time there in another life. It had been years since I stopped going, and the city had changed so much that I knew I wouldn't see any of the old faces. I was a few steps into the alleyway when I heard a car start behind me. An engine growled into life, flexing its muscles before falling into a smooth rumble. Light flooded the narrow path and a crooked silhouette grew out from my feet. Thinner than I remembered it. I looked over my shoulder, into blinding high beams. The car was idling at the alleyway's entrance. Nothing to see here. I turned and kept walking. I was halfway along when the beams shook. When they started following me. The engine revved and the car moved closer. It sounded just two or three feet behind, and I knew then that I'd never really disappeared. I could feel the headlights, burning into my back. I didn't want to turn and look through them at the driver anymore. I was afraid of who it might be. I pressed myself into an alcove so the car could pass. It stayed where it was for a few seconds. Squinting into the light I saw a BMW, all gleaming black paint and chrome. I could feel the night in my lungs. The blood, singing through my veins. A window came down but I couldn't see inside. "Detective Constable Waits?" said a man. I heard a woman's laughter from the passenger side. "We're not asking, handsome. Get in." Joseph Knox was born and raised in and around Stoke and Manchester, where he worked in bars and bookshops before moving to London. He runs, writes and reads compulsively. Sirens is his first novel. 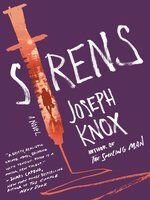 British author Knox’s impressive debut plunges the reader into the darkest corners of Manchester’s druggy club scene. When David Rossiter, a powerful politician, seeks help tracking down his wayward 17-year-old daughter, Isabelle, now in the orbit of drug kingpin Zain Carver, the police brass select Det. Aidan Waits, a disgraced undercover officer caught tampering with evidence, as the man for the job. Waits must go after Carver and the corrupt officers who keep him in business with little support and only the merest hope of professional and personal redemption. Waits’s youth makes his being so hard-boiled a bit implausible, but Knox sets a dizzying pace and convincingly evokes the murky, unbalanced atmosphere of an empire built around drugs and money with vivid prose. As Waits, himself a drug user, peels back the layers of old cases and past loyalties, the stakes rise for him and several young women in the middle of Manchester’s nightlife maelstrom. The hard-hitting action builds to a bleak, wrenching conclusion because, of course, not everyone can be saved. Agents: Antony Topping and Dan Lazar, Writers House. On the outs since being caught stealing drugs from the evidence room, Manchester police detective Aidan Waits is pressured by a superior into posing as a bounced cop to investigate a top drug dealer and hired by a member of Parliament to find and report back on his runaway teenage daughter.The dealer is Zain Carver, a slick operator whose stroke of brilliance is to sell drugs at the bars and clubs he owns, with the bar manager distributing the goods and an attractive female employee collecting the money. Conveniently enough for the damaged Waits, who narrates the novel through a cocaine haze, the MP's down-and-out 17-year-old, Isabelle, has fallen in with Carver. The deeper Waits pushes into a world of ruthless drug bosses, dirty cops, and corrupt politicians, the more he opens himself up to abuse--there's hardly a scene in which he isn't receiving or recovering from a serious beating. But after falling for one of Carver's collection girls and awakening to Isabelle's dire predicament, he becomes determined to do good. The book is longer than it needs to be, losing sight for long stretches of the key disappearance a decade ago of a woman who was preparing to testify against Carver. 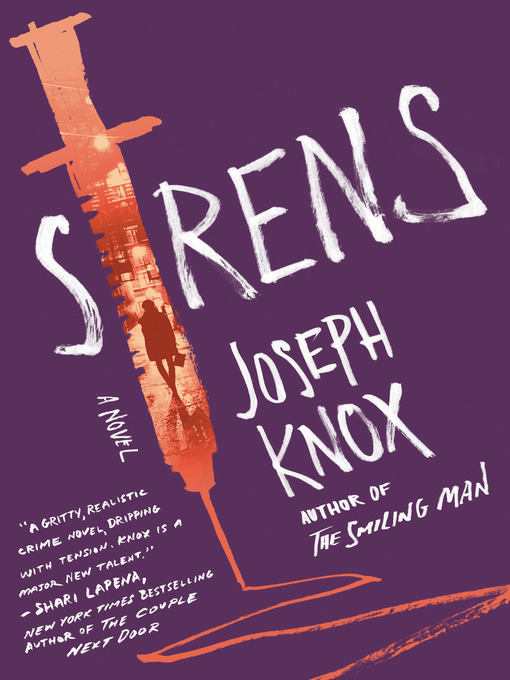 But Knox, taking a cue from legendary Manchester band Joy Division's doom-laden romanticism, is brilliantly in command of the book's unusual blend of horrific and hopeful. And in what other crime novel are you going to learn that ultraviolet lighting is used in certain clubs so addicts wanting to shoot up can't see the veins in their arms?A powerfully assured debut by a British novelist who has the potential to be a leading player in modern noir.